Political debates are hitting up Nigeria for the 2015 presidential elections. The debates are divided among regions, political divides and individuals in the country. Ndigbo are the most affected in these un-organised debates. Bystanders are watching some Ndigbo make a mess of their people in a disgusted manner. Many of them, who are in the employ of the present government, want continuity, whereas others in and out of the government want the president of Nigeria to come from the Igbo extraction, in the next election. To a former Governor of Abia State, Dr. Orji Orji Uzor Kalu, it would be un-frankness if the president of the country did not come from Igbo in 2015. Kalu buys into the debate that Igbo must produce the president of this country in 2015; he has floated an organisation called Njiko Igbo in that regard. Njiko Igbo is his project aimed at uniting Ndigbo for this task. Kalu’s insight into this project speaks positively volume, as a politician, influential businessman and founding member of the ruling People’s Democratic Party (PDP). His love for Ndigbo and the unity of Nigeria is unquestionable; he is incessantly travelling out of the country to seek for Igbo unity and attract investors into Nigeria. To this fact, Kalu can be said is one of the foremost image-makers of Nigeria in this democratic dispensation. As a country that is rated in the comity of nations as developing, Kalu believes that Ndigbo should not relax in their oars and watch the political events of the country being handled by people from other regions of the country as from time to time; Ndigbo should be able to identify political opportunities for their engagement and growth. He believes that politics has become a key focus of Nigerians. In this regard, he has been to many countries in Europe, USA., Guinea, Sierra Leone, Togo, Congo and partially visited Namibia and Angola for the continuous preachment for the unity among Ndigbo and by extension, the Nigerian people. Upon that there are a lot of governance challenges today in Nigeria, Kalu believes so much in the axiom that no matter how hot anything may be, it will cool down someday. Kalu has been clamouring for the boost in security, economy and the spirit of many Nigerians that are discouraged, because of the challenges facing the country – manmade and natural-made – especially as the president had pleaded to Nigerians to give his administration up to 2013 to reform the country. Ndigbo cannot be fulfilled Nigerians once the continuous relegation of them is orchestrated as their fate not to clinch the exalted office of the president of the country. In an interview, one of the auctioneers of Igbo presidency to other regions in Nigeria come 2015, a woman from the South-East, said that what she knew was that 2015 is a mirage for the Igbo, because Nigeria has an incumbent (president) and that he may run for a second term. “Even if the president says he will not go for second term, I’m not sure that northerners will agree that an Igbo should go. Let’s plan for 2019, which is more realistic,” the woman said. It is very unfortunate that someone who is known as a politician from the South-East can condescend that low, by becoming an apologist of northerners. She forgot that the northerners had held Nigeria down for uninterrupted 35yrs, recycling power among themselves. This is against what Kalu has severally said that those persons from other tribes who have ruled Nigeria for years did not have two heads as against one head. Kalu believes in the possibility of an Igbo presidency in 2015, and he has started to build bridges of dialogue and form strong partnerships across any warring opinions. Kalu is not alone in this movement; many of his supporters are of the opinion that this Njiko Igbo project is feasible. Many dignitaries from other tribes are also aligning with this vision, a fact that has buttressed that Njiko Igbo is breaking any cultural and political barriers that had held Ndigbo down for ages, and is making sure that other regions see reason why there should be an Igbo presidency in 2015. It is however imperative to say that no matter all the auctioneers that have surrounded this Igbo presidency project because of their personal political lucre in this present government, Kalu who has bought the idea of Igbo presidency should continue to put in his best forward, and should not mind those voices begging for the Igbo presidency beyond 2015. Ndigbo should not beg for the presidency because they do not signify weakness both spiritually and otherwise. thumb up kanu.if only rochas realise that. I stil believe dat orji iz right bcus base on wot he had said i think we shud b part of d cospiracy 2 support njiko ndi igbo 4 presidency @2015 election. Say no 2 northdrners dis time. 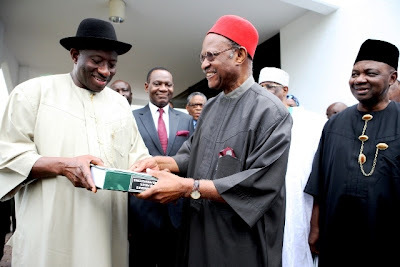 njiko ndi igbo is ok. For igbos to be president is good weda good or bad. Good we all enjoy, bad they paid what they own us. So let put head together to acturize it. Naija is already corrupt even if angel micheal become d president of dis country notin will change,only God can save us.